IMO, humans are not inherently rational. If they were, then why do many buy high and sell low? IMO, even in aggregate, humans are frequently not rational in the short-term. Mr. Market is sometimes emotional and tends to overreact. For example, I do not understand why Mr. Market believes CELG is worth approximately half of what it was worth less than 8 months ago. Was it overvalued 8 months ago or is it undervalued now? In NC, Republicans in the legislature hold a veto-proof supermajority in both houses, so despite a Democrat in the Governor's mansion, not much has changed policy-wise. The recent teacher's march in Raleigh garnered national headlines, but it is doubtful it will move the needle much. However, education is an issue that is uniting people across all political persuasions (teachers are both conservative and liberal). They could represent a deciding block in a state that is trending purple (Cooper won by less than 11K votes out of almost 5M ballots, less than 1%). Most of the discussions in Democratic circles are trying to break the supermajority in at least one state house to be able to protect Gov. Cooper's veto. Also of interest is that several legislative districts were redrawn due to the recent Supreme Court ruling, but some are still on hold pending an upcoming appeal ruling by SCOTUS. I was reading the Yahoo and AJC comments about Abrams (note to self: STOP READING THE COMMENTS...THEY JUST UPSET YOU), and many on the GOP side were arguing about turnout, saying that there were more Republicans than Democrats who turned out, and that basically that meant Abrams had no chance. But then I read that four years ago the Republicans outnumbered Democtrats by 300,000 in the primary voting and this year it was 50,000. Anyone know if that's true? In 2014, 593k folks voted in the GOP primary while just a little over 300k voted for the Democrats... but there is an easy explanation for that huge disparity... the only race that was really contested was on the GOP side. For governor, the GOP had a 3 person race, but one of those 3 was the incumbent Nathan Deal and the race was not considered very close with Deal taking 72%+ of the vote. There was a hotly contested 6-person Senate primary on the GOP side to replace Saxby Chambliss. 3 candidates got between 20 and 30 percent of the vote and that race really drove attention and turnout. On the Democratic side in 2014, the governor primary was Jason Carter running unopposed. Not much reason to turn out to vote in that race. The senate race featured 4 candidates, but everyone knew Michelle Nunn was going to win it. She got 75% of the vote. One other point - Georgia has 159 counties, and many determinative races for county seats are determined in one primary of the other. I live in a suburban county in which all candidates for county commission are registered Republican. So I have to pull a Republican ballot to vote for my local elected officials, even if I may vote Democratic for governor in the fall. The major city near my home is exactly the opposite. I know many folks who pulled a Democratic ballot for the primary to vote on local races, even though they may vote Republican in the fall. As Tip O'Neil (IRC) said, "all politics is local." Jason's analysis is excellent, but I would caution drawing too close a correlation between primary party balloting and November's open election. There is no question, though, that Georgia's demographic trends would historically indicate a purpling of the state. Not so sure about this. Your initial post said she was polling about 20% ahead of her only competitor (and I think she won by 50%). As a primary voter, I'm not sure how motivated I am to make my feelings known in that race. Whereas the other primary had 5 relatively strong competitors with no one polling near 50%, so as a primary voter I would be much more motivated to get my guy into the run-off. But really, with the election 5+ months away, there is just so much that can happen to either energize or demoralize either side. Heck, a lot will happen in the next week. And since mid-terms (since forever) are about whoever is in the White House, I'm not sure participation in a primary says anything. You're voting for/against someone in your own party. Not near as much fun as sticking it to the other side. Last edited by dudog84; 05-23-2018 at 02:55 PM. I suspect the Atlanta media market is dancing a jig. They are going to be saturated with campaign ads. Atlanta media consumers, meanwhile . . . .
That's why God invented the mute button. Now, if (S)he would just get around to robo calls. Can't imagine it will be as bad as Chicago, with 2 billionaires running for Governor of Illinois. I suspect the Georgia race will get beaucoups of outside money. I don't know enough about the Illinois race to venture a guess. Massachusetts - deeply blue - has a Republican governor, Charlie Baker. He is, according to polls, the most popular governor in the country. He is facing a challenger in the primaries - Scott Lively. As a resident of Massachusetts who visits tables set up by both Republicans and Democrats at the local 4th of July (and other town fair) celebrations, I can tell you that the literature handed out at such events by the Massachusetts Republican party is all about one issue, increasing access to guns. I have heard some state Republican operatives interviewed recently and they are not as happy with Governor Baker as his polling numbers would indicate. He is facing a challenger because many in the state Republican party feel his popularity comes from being too much like a Democrat. Baker is pro-choice and increasing access to guns is not a priority with him. Scott Lively is not pro-choice, would like to increase access to guns, and stands with President Trump on many issues, most notably immigration. If Scott Lively wins the GOP primary, he will lose, bigly, in the general. There are a significant number of Massachusetts residents who are not pro-choice and would like to increase access to guns but there are not enough of them to win state office, hence the deeply blue nature of the state's elected officials, governor excepted. Mitt Romney was pro-choice when he was governor here, for example. 1) the Puerto Rican migration post Hurricane Maria. I've seen some interviewed who think of their moves (predominantly to Florida and the Northeast Corridor) as permanent. I've heard more than one say that the first thing they did post move was register to vote. 2) the Parkland influence - one of the big points of those marches against gun violence was to get newly minted 18 year-olds registered to vote. Those voters are being encouraged, at least for this next election, to be single issue voters - "Do not vote for anybody who takes money from the NRA". Those voters are also very hard to poll. The spending on the Illinois governor's race is really incredible - it will be hundreds of millions of dollars. Which is somewhat ironic given the state of Illinois' finances - that money could make a small dent in the state's roughly $8 billion bill backlog. Pritzker, the Democrat, is a Duke alum and is from Hyatt money. Rauner, the Republican, is the incumbent and made his fortune in private equity. As noted in the article, both spent a small fortune to win their primaries. The state's finances are in a very challenged position between the bill backlog, huge pension liabilities and financial challenges for the city of Chicago and Chicago Public Schools (also significantly related to pensions, among other things). The legislature is controlled by Democrats. Rauner came into office vowing sweeping changes but after a long standoff without a budget, compromises were reached. His primary opponent accused him of giving in to the Democrats, but was unsuccessful in defeating him. And just when Chicago comes up for air after this election, the city has a mayoral election in early 2019. Incumbent Rahm Emanuel is the favorite, but a number of contenders will be actively going after him. one of the big points of those marches against gun violence was to get newly minted 18 year-olds registered to vote. Those voters are being encouraged, at least for this next election, to be single issue voters - "Do not vote for anybody who takes money from the NRA". Those voters are also very hard to poll. For several years there has been this belief in the liberal world that the cell phone dependent youth were not being polled properly and would tilt things toward progressive candidates in ways the polls did not expect. So far, we have not seen it... not because all the pollsters are doing a great job of reaching millennial but because they just plain refuse to turn out and vote. As this chart from the US Election Project shows, folks under 30 are the least reliable voters. As you can see, the highest rate of turnout we have seen for voters under 30 was Barak Obama's first election in 2008. 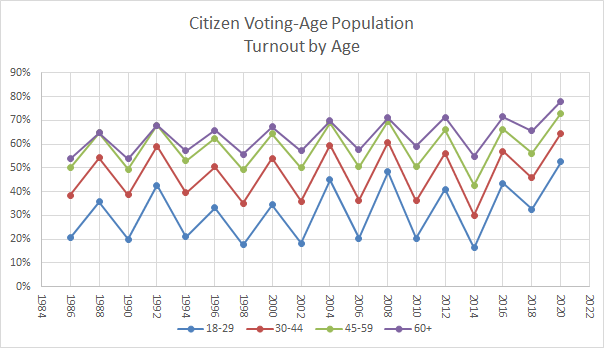 In 2014, the last mid-term race, we had the lowest young turnout of the past 30 years. Just curious...if it were a senate or a house race, I could see the outside influence being extremely high, but why a governor's race? I wonder if people born in certain years are more likely to vote than others? For example, someone born in 1979 might be more likely to vote at any age than someone born in 1985. Which would lead to additional by year variance as certain birth years "age out" of one age range and into another. I'm not sure you could find a good way to accurately measure, much less predict, that behavior but it seems like a confounding factor. I suspect a data set that somehow accounted for that would lead to slightly smoother data (at least across comparable election years, midterms are naturally always going to be lower than presidential years for example). A not insignificant portion of people in the 18-29 range for the 2008 election would have been in the 30-44 range for 2012. I also think it would be easier to interpret the trends if the graph was broken into 4 separate graphs, one for each year in the 4 year presidential election cycle. Having said that, it is not surprising that the youngest age group would be the most volatile, since that is when most people go through their most significant life changes. Well, that's the big question, isn't it? And the polling won't necessarily tell us. I didn't say all youth voters are liberals either. They are, however, being encouraged to register and to be single issue voters in 2018. Now, is every single one of these kids going to register to vote and take their handy guidelines on NRA money into the voting booth with them? Of course not. But some will. And how many is a question worth discussing. The state races are extremely important to the national elections. The state houses set the electoral districts and the governor can have a big influence on voting requirement. Also the governors are the omes more in touch with local politics and they make themselves heard in setting the national agenda. Obama was very much criticized for his lack of interest in the state races and the Republicans used them to great effect. I believe the Dems strategy now has included a more aggressive focus on the state races. This wasn't a coincidence (not that you were implying that it was). The youth vote was a HUGE part of Obama's branding and strategy, and a big part of his grassroots campaign growth was first-time voters. Add to that, the first meaningful use of social media strategy and online fundraising, and it was sort of a perfect storm to get young people to the polls. Of course, most of those "young voters" are now "not as young voters," so the process will have to start all over again to re-engage the youth vote. It will require a massive undertaking and some revolutionary thinking for either party to pull something like that off again.